After decades of war, civil unrest and recurring natural disasters, Afghanistan has significant recovery needs. Despite recent progress, millions of Afghans still live in severe poverty with a crumbling infrastructure and a landscape that is suffering from environmental damage. About 33 percent of the total population—some 9.3 million people—are food-insecure. Insurgent activity and military operations have impacted food security in some regions, as well as reconstruction efforts and humanitarian interventions. The levels of food insecurity and undernutrition are so high that Afghanistan is one of the 10 countries in the world with the highest burden of undernourished children. In addition, years of environmental degradation in the country, combined with its natural landscape, make Afghanistan highly vulnerable to intense and recurring natural hazards like flooding, earthquakes, avalanches, landslides and droughts. An estimated 235,000 people affected by natural disasters and nearly 750,000 conflict-affected people will require humanitarian food assistance in 2016. 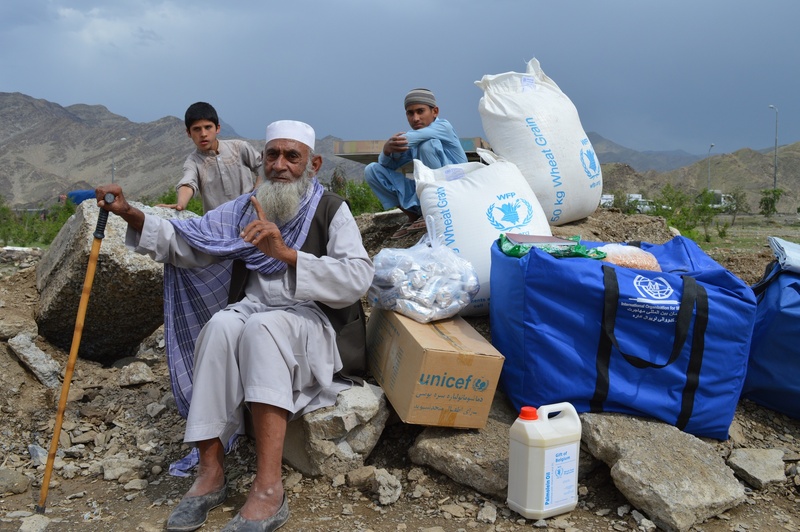 WFP has been working in Afghanistan since 1963 and remains active in all 34 provinces. WFP has shifted its focus in recent years from emergency assistance to rehabilitation and recovery. WFP assisted more than 3.6 million people in 2015, primarily in remote, food-insecure rural areas. WFP’s food assistance focuses on poor and vulnerable families, schoolchildren, illiterate people, returning refugees, internally displaced people and disabled people — with an emphasis on vulnerable women and girls. School meals and take-home rations: In 2016, WFP gave more than 255,000 students a take-home ration of vegetable oil as an incentive for their families to send them to school. Food for Training: In 2015, WFP provided more than 10,000 people — mostly women — with food rations and electronic vouchers while they attended classes in literacy, handicraft production, carpentry, plumbing, reproductive health and childcare. Disaster Risk Reduction: In 2016, more than 500,000 people received WFP food assistance through asset creation activities and infrastructure rehabilitation for roads, canals, flood protection walls and terraces. Nutrition: In 2015, WFP reached more than 814,000 vulnerable women and children with take-home food baskets, essential micronutrient tablets and specialized nutritious food. Purchase for Progress: WFP works with local farmers to boost soybean production and with the Ministry of Health to establish food quality and safety standards, as well as support national flour fortification programs. WFP has also worked with the government to construct a strategic grain reserve to hold 200,000 tons of emergency food supplies that can assist some 2 million people for up to six months.